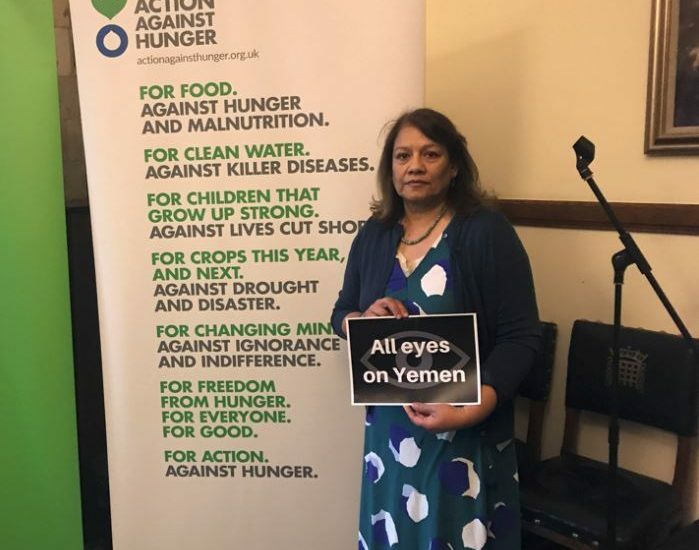 I attended a Yemen All-Party Parliamentary Group event in Parliament on Wednesday 21 November 2018. People in Yemen are facing one of the worst humanitarian situations in the world. Airstrikes and fighting are continuing across Yemen despite efforts by the UN to get both sides to agree to a cessation of hostilities and hold peace talks later this month. 22 million Yemenis are in need of aid and protection. Using a virtual reality headset, I was able to visit a school that had been almost completely destroyed, a home where eight members of the same family were killed and a settlement where Yemeni families who had fled fighting are now living without running water, toilets or any other basic facilities. Norwegian Refugee Council, Oxfam Great Britain, Action Against Hunger, War Child and other organisations involved in the exhibit are calling for the UK Government to suspend arms sales to any party in the Yemen conflict and to push all parties to the conflict to cease hostilities immediately. They are also asking the UK Government to pressure all parties in the conflict to allow commercial and humanitarian supplies of food, fuel and medicine to reach those who need them most. 14 million Yemenis are at risk of famine and nearly half of all children aged between six months and five years are chronically malnourished. At a meeting of the security council on Monday 19 November 2018, the UK tabled a new draft resolution calling for an immediate ceasefire in the battle for Hodeidah. The Shadow Secretary of State for Foreign and Commonwealth Affairs asked an Urgent Question to the Secretary of State on 21 November 2018 calling for a statement on the UK’s effort to secure a new UN Security Council resolution on Yemen. The Shadow Secretary of State asked what compliance with the resolution will be monitored and by whom, and what what sanctions will apply to any party that breaches its terms, whether in terms of the ceasefire or the restriction of humanitarian aid? The UK Government must exercise its power and influence to prevent the situation from deteriorating further.